Over the end of July and beginning of August eight of our SmithCorp employees took the opportunity and travelled to Namibia to embark on a charity project to help out a local primary school in a very small community in Damaraland, Namibia; a scenic yet rugged and dry area that is part of an elephant conservation scheme. Funded by the SmithCorp Charitable Trust the build itself was designed to provide the primary school with more protection from the local elephant population. 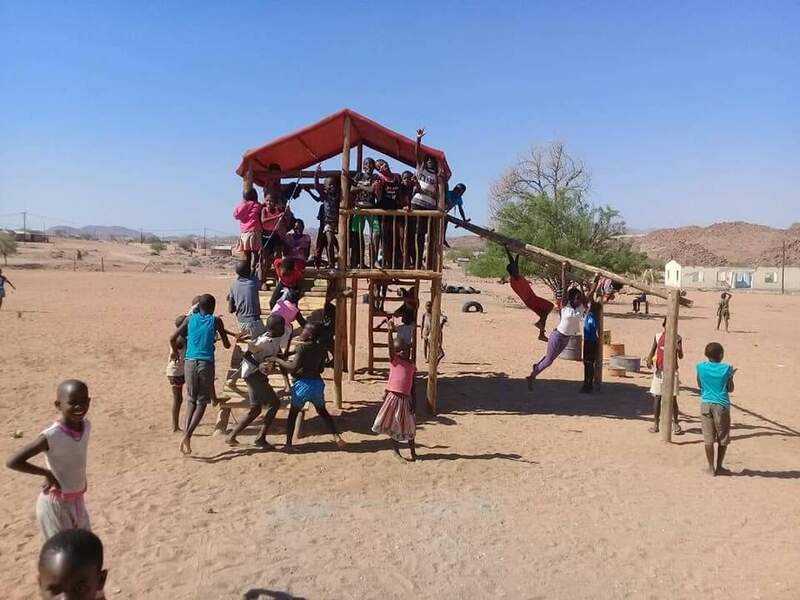 A.Gariseb Primary School is situated in a remote part of the desert and currently, the 280 students (the majority of whom stay on site during the week) are very susceptible to any wandering elephants, and are forced indoors whenever they are in the vicinity, sometimes for hours on end. The purpose of the wall is to a provide a small sanctuary for the children, giving them an area they can play in, whilst ensuring they can do so in a safe manner. The journey out for our volunteers was arduous, starting with a 25 hours delay in Heathrow, a stopover in Addis Ababa, arrival in Windhoek and ending with a 6 hour life-or-death thrill ride across the Namibian countryside in the back of a minibus which definitely had all 4 wheels off the road at one point! On the first day they visited the site they would be based at for the duration of the trip – tents under the stars! They were extremely basic but comfortable and perfect to lay their heads down at the end of each day. All food was prepared by the local community and cooked over an open fire. The early part of the week was spent focussing on preparing the site for the build – 17,000 bricks had to be moved into position near the wall. Several days were spent travelling up and down the short journey to the local river to excavate several sand-pits and multiple 50kg bags of cement had to be carried into position. Once the prep work was done and they had been shown the basics of laying bricks, they then spent most of the time building up the wall to the required 1.8m height, which was surprisingly straight! Their days were hot, long and extremely tiring but they worked hard and put in everything they had to finish the project on time! They also helped to construct a “jungle gym” consisting of several wooden structures to provide a playground for the children to use. 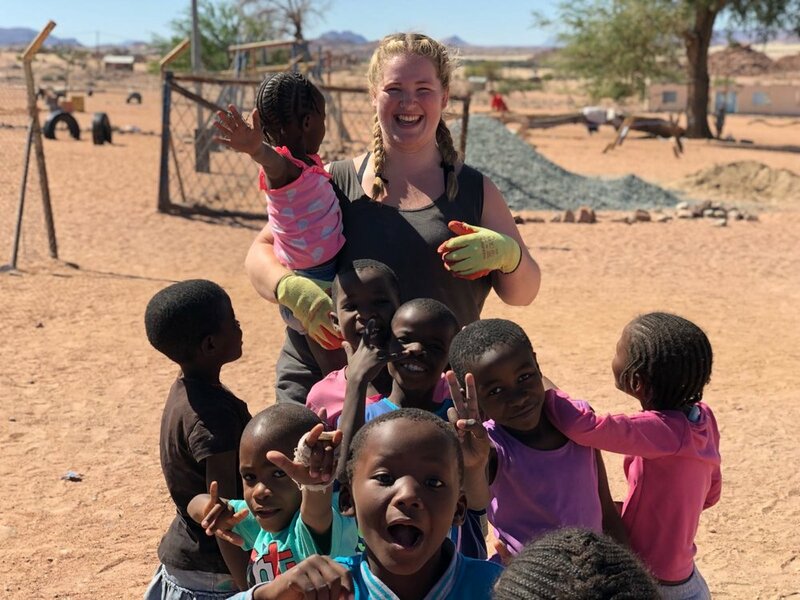 They were then lucky enough to have the chance to track the elephants and came face-to-face with them on multiple occasions before enjoying the local culture in Swakopmund. It was then time for the return journey home which thankfully went with slightly fewer hitches! They are currently creating a video to show at the Charity Ball in November, which details the full construction of the project.